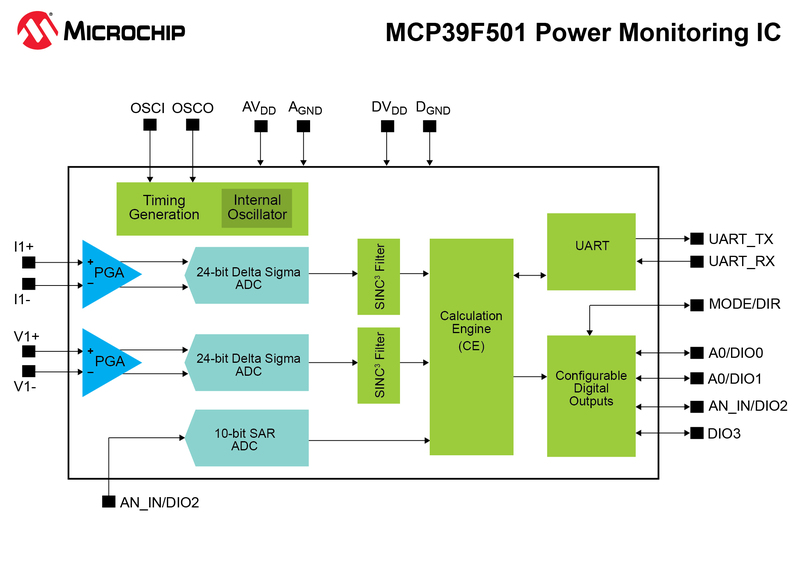 January 2014 Bangalore, India – Microchip Technology Inc., a leading provider of microcontroller, mixed-signal, analog and Flash-IP solutions, today announced a new power monitoring IC, the MCP39F501. 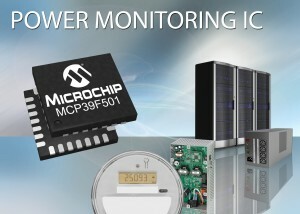 This device is a highly integrated, single-phase power-monitoring IC designed for real-time measurement of AC power. It includes two 24-bit delta-sigma ADCs, a 16-bit calculation engine, EEPROM and a flexible two-wire interface. An integrated low-drift voltage reference in addition to 94.5 dB of SINAD performance on each measurement channel allows accurate designs with just 0.1% error across a 4000:1 dynamic range. The MCP39F501 power monitoring IC allows designers to add power monitoring to their applications with minimal firmware development. 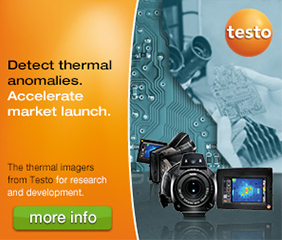 Its performance enables designs capable of 0.1% error over a wider dynamic range and superior light load measurement versus current competing solutions. 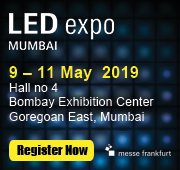 In an effort to improve power management schemes in power-hungry applications, such as data centres, lighting and heating systems, industrial equipment and consumer appliances, power-system designers are driving the need for enhanced power monitoring solutions. This includes requirements for better accuracy across current loads, additional power calculations and event monitoring of various power conditions. 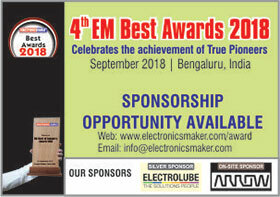 The built-in calculations include active, reactive and apparent power, RMS current and RMS voltage, line frequency, power factor as well as programmable event notifications. The MCP39F501 device enables high-performance, cost-effective designs in the commercial (e.g. server and networking power supplies, power distribution units, lighting systems); consumer (e.g. 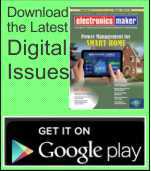 appliance and smart plugs); and industrial markets (e.g. power meters and industrial equipment), among others. Additionally, the wide operating temperature range from -40°C to +125°C allows the MCP39F501 to be utilised in more extreme environments, such as industrial machinery applications. 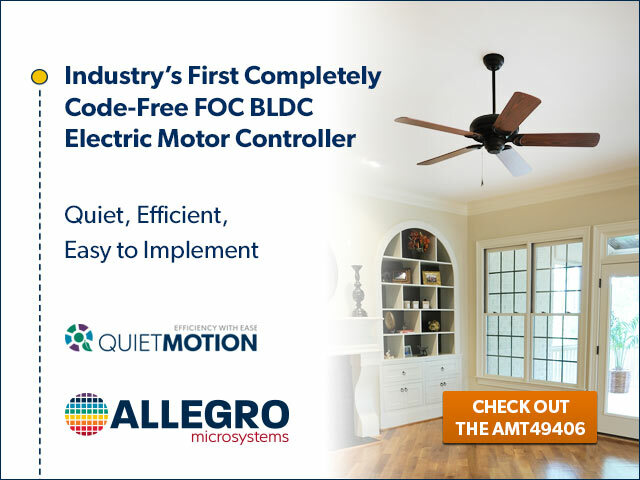 “Government regulations, technology innovations and end customer expectations are driving the need for better power monitoring solutions in consumer, commercial and industrial products,” said Bryan J. Liddiard, marketing vice president of Microchip’s Analog and Interface Products Division. 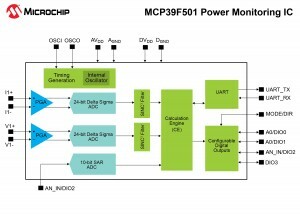 The MCP39F501 is supported by Microchip’s MCP39F501 Demonstration Board (Part # ARD00455), which is available now. The MCP39F501 is available now for sampling and volume production in 28-lead QFN 5 mm x 5 mm packages. It is supplied in 5,000-unit quantities.